A group of residents frustrated with the design of an intersection in their midtown Toronto neighbourhood took matters into their own hands this week, using sidewalk chalk and thousands of raked leaves to force traffic to slow down. Regal Heights resident Dave Meslin came up with the idea after years of worrying about the intersection at the corner of Regal Road and Springmount Avenue — near St. Clair Avenue West and Dufferin Street. He says many vehicles cut through to get away from the often jammed streets nearby, such as Oakwood Avenue and Davenport Road, and he wanted to make for a shorter, safer crossing. 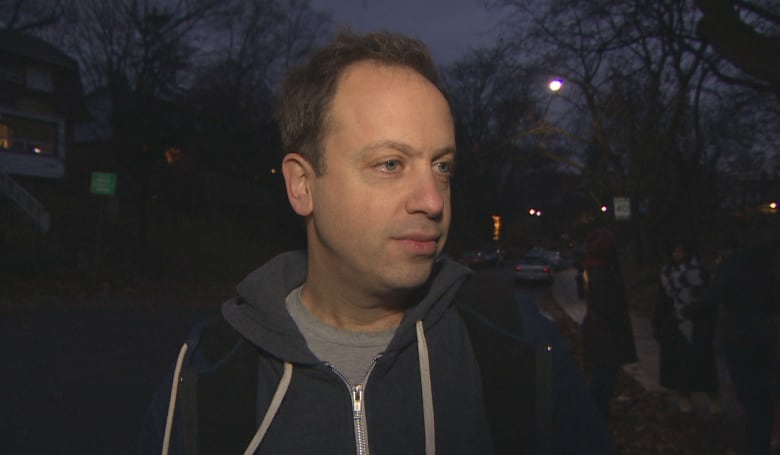 Tired of having to look over his shoulder to walk through safely, Meslin says he decided to pick his neighbours' brains to see how they might redesign the intersection on their own. Together, they created a kind of do-it-yourself mock-up — with the help of some of their kids. 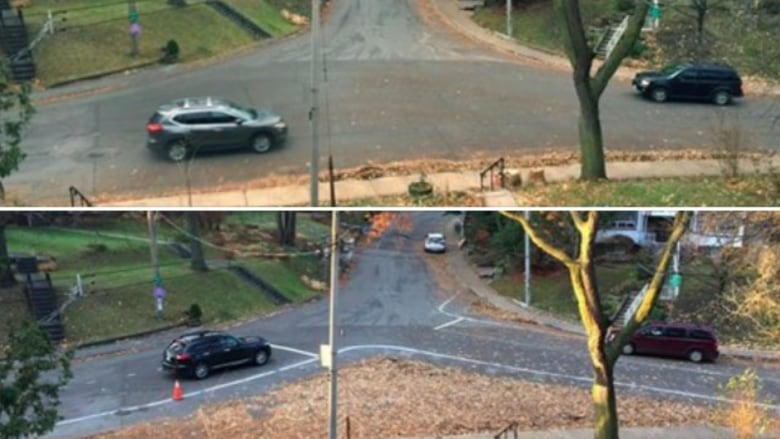 "We filled that whole space with tens of thousands of leaves using children and their skills of sweeping and raking," he explained to CBC Toronto, laughing. The move left a metre-and-a-half of sidewalk that the kids decorated with chalk. "We created this temporary example of how the neighbourhood could be safer," he said. When Meslin and his neighbours measured other roads in the area, they found most run 8.5 metres wide. That meant there was about 185 square metres of surplus space at their intersection that could very well be turned into a parkette with benches or trees and still allow cars the space they need to pass through safely, he said. The plan was to leave the chalk and leaves intact for just a day. That is, until they saw what kind of impact it was having. "It looked so good and it was so inspiring to see cars stopping for the first time ever that we decided to leave it for a few days," he said. "Traffic instantly adapted to what should be the design of the intersection in the first place." Andrew Tay, who has lived in the neighbourhood for four years and happens to be a designer himself, says cars seem to blow through the intersection all the time, often right past stop signs. "The street is so wide, it's easy to kind of fly through," he said, adding that perhaps some don't notice the signs to stop. When he heard about the plan to re-imagine the intersection, he says he was skeptical — until he saw how drivers were behaving. Adrian Griffiths noticed the change too. "It worked. For those few days, people actually saw that they needed to slow down, there was a different flow through this intersection and they actually paid attention to the signs." In fact, when he first saw the lines drawn on the road, he says, he mistook it for the city planning a redesign. 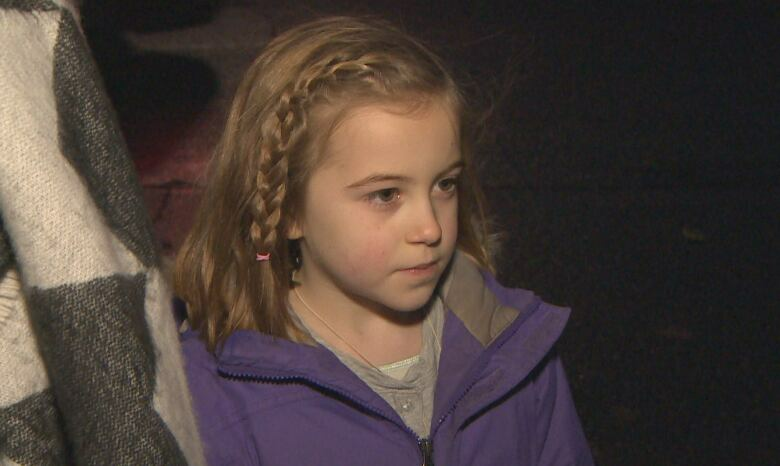 "I got very excited about it, I was messaging everyone in the neighbourhood," he said. Meslin says he wanted to wait to see how the project would turn out and whether neighbours supported it before approaching the city. At an annual neighbourhood meeting last week, he says, support for the idea was unanimous. And it wasn't just the neighbours. When Meslin posted about the experiment to social media, it garnered a ton of attention. Since then, Meslin says he's spoken to his local councillor, Cesar Palacio, about turning the idea into reality. CBC Toronto reached out to Palacio but he did not reply in time for publication. The city's transportation services says they are looking into making changes like these to intersections across the city as part of their city Zero Vision plan and Complete Streets plan. They ask that residents call 311 before making changes to ensure road safety. "The city will then be able to work with the community and review and evaluate opportunities for permanent installations," a city spokesperson told CBC Toronto. "I think we all know this won't happen overnight. It's a pretty major reconstruction, because the intersection is so poorly designed now that it will affect how the sewers work, it'll affect garbage collection, snow removal," Meslin said. But he's holding out hope that his neighbourhood's dream for the intersection will become real. "There's a certain risk aversion in the bureaucracy … and it's our job to push against that gently and politely, but firmly," Meslin said. "Sometimes neighbours just have to come together with some chalk and some leaves and lead the way." An earlier version of this story reported that the intersection had no sidewalks. In fact, residents wanted to make a shorter, safer crossing.